One of the events was a 5.17 km run to raise awareness and celebrate the May 17 anniversary of the day in 1990 when the World Health Organization removed homosexuality from a list of diseases. But organizers told participants to run on their own and not en masse. An organizer of the runs held in Beijing, Liu Yifu, told Reuters that they did not dare to stage any mass events in the capital this year for fear that proceedings might be interrupted by the authorities. Many event organizers and volunteers spoken to by Reuters said they had to be wary. 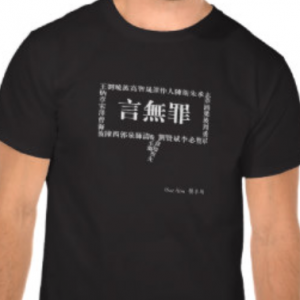 Large gatherings and protests without approval are technically illegal in China. On Sunday late afternoon, police cars allegedly came to monitor the area where the people were giving out the badges, and the activity was marked as an “illegal gathering.” Local guards started to surveil the area and denied entrance to the park to those wearing rainbow badges. […] According to Zakki, things turned violent when two females and guards clashed over the rainbow badges, which is the moment of the video that is going viral. 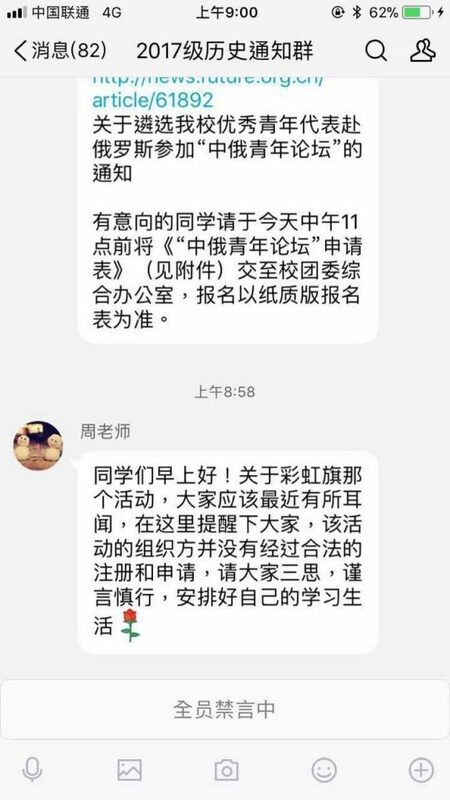 Although the topic was discussed by many on Weibo and WeChat, articles and videos of the incident were soon taken offline. Everyone, please don’t participate in illegal assemblies in any form, on campus or off. A small number of students have been influenced by western subculture, and today may be on internet platforms advocating homosexual activity. Everyone, please don’t follow these posts and threads, and furthermore do not participate in assemblies! They provide discounts on so-called “WHU Sexual Orientation Equality Research Group” flags. They mislead the public, incite widespread student participation in “gay” community activities, and encourage students to dip into “gay culture”. They even deny the scientific conclusion that homosexual activity spreads AIDS. They say things like “AIDS is no excuse for homophobia”. This matter is extremely important. These people have possibly established ties with off-campus influence, and even domestic and international influence. Students should pay attention to this and take it seriously. Please, every class appoint a committee member, and as soon as possible, during this morning’s class break, verbally warn classmates to pay attention! Please don’t disseminate the above-mentioned information online, and don’t screenshot my messages. Make sure you understand the verbal warning, and spread it to your classmates properly. This is requested of everyone. Good morning classmate! Due to your absence from the class group, I’ve been entrusted by the group with notifying you! But your reply left me very unsatisfied! You’re a student of Wuhan University. You should consider the interests of this institution, and not blindly persist in your small error! This matter is extremely important. 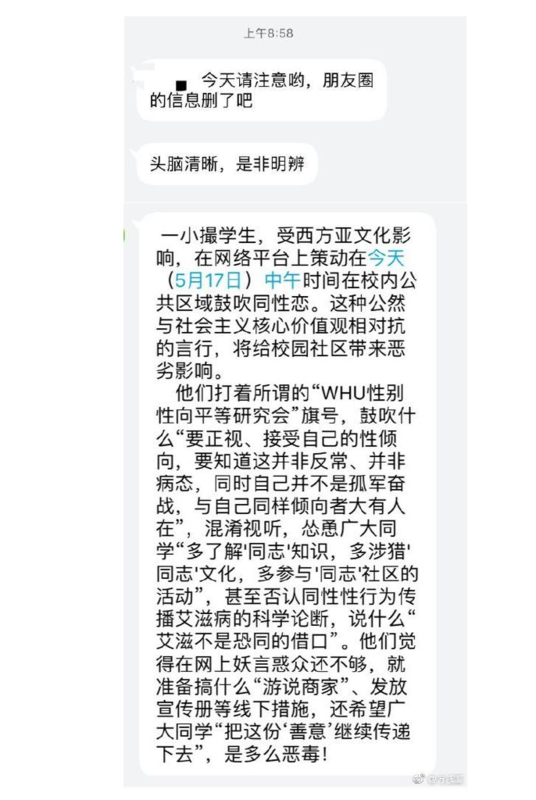 You’re expected not to repeat this propagation on Wechat Moments! Do not resist again! 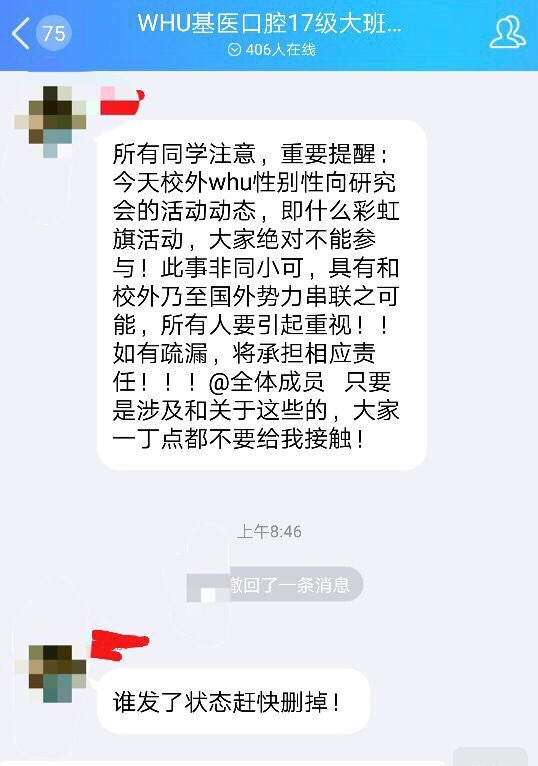 You’re expected to delete the Wechat Moment, ASAP. Also, do not participate in the next illegal assembly. I await your reply! I didn’t do that repost on Moments for anyone’s approval. I am free, and it’s my prerogative. I am in charge of my Wechat Moments. That’s the first point. Secondly, if it’s my alma mater’s request that I delete, I can only say I don’t approve. Also, I don’t consider my sexual orientation to be an error. All forms of love and affection between two people should be respected. You’re not capable of that respect, but at least try not to defame my orientation. Thirdly, what do you mean by ‘Do not resist again’? Take whatever measures you like against me. Do as you please. I’m not scared. Thank you sincerely for your warning and solicitude! Actually, I hope you can educate yourself. I am very dissatisfied with you. All classmates take note of this important reminder: Today there is an off-campus WHU Sexual Orientation Research Group activity, namely a rainbow flag activity. Everybody must refrain from participating! This matter is not trivial. It possibly involves ties established with off-campus and even overseas influence. Everybody must take this seriously!! If you’ve slipped up, take appropriate responsibility!!! @ All members, if it has anything to do with this, do not contact me even briefly! Anyone responsible for bringing about this state of affairs, get deleting! Please pay attention today! 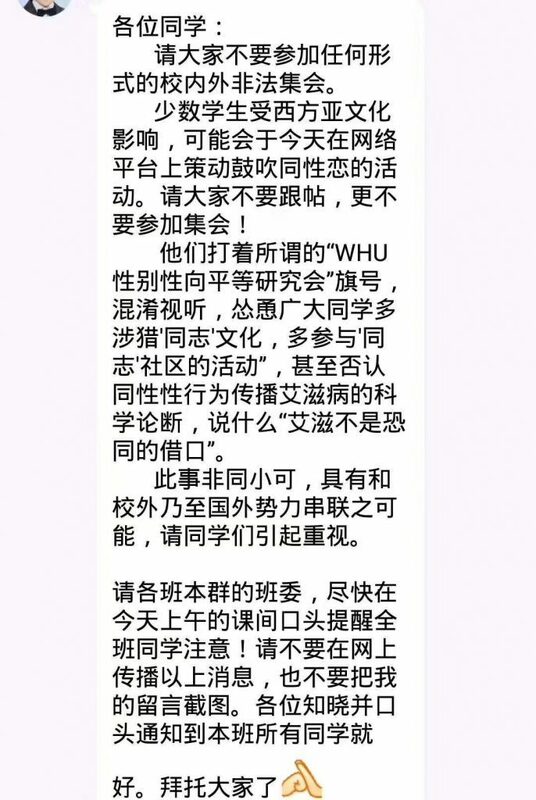 Delete Wechat moments information. Mind clear, right and wrong clearly discerned. 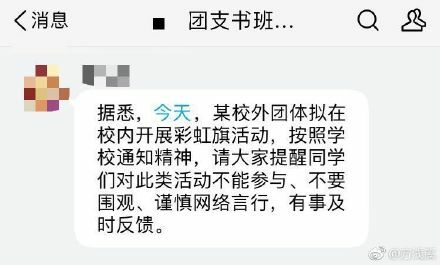 A handful of students, subjected to western subculture influence, have plotted on internet platforms to gather in a public area on campus, today (May 15) at noon, to agitate for and promote homosexuality. This sort of brazenness stands opposed to socialism’s core system of values, in word and deed. It will bring an evil influence into our campus community. They hoist their so-called “WHU Sexual Orientation Equality Research Group” flag, and advocate “facing up to and accepting one’s own sexuality and gender orientation. Knowing this is not an abnormal or morbid state, while also knowing that you are not alone in this struggle, that there is support, and that people with similar orientations are by no means rare.” These people confuse and mislead the public, inciting among students a widespread “greater understanding of ‘gay’ knowledge, a greater familiarity with ‘gay’ culture, and more participation in ‘gay’ community activities.” They even deny the scientific conclusion that gay sexual activity spreads AIDS. They say things like “AIDS is no excuse for homophobia.” They feel it’s not enough to lie and mislead people online. 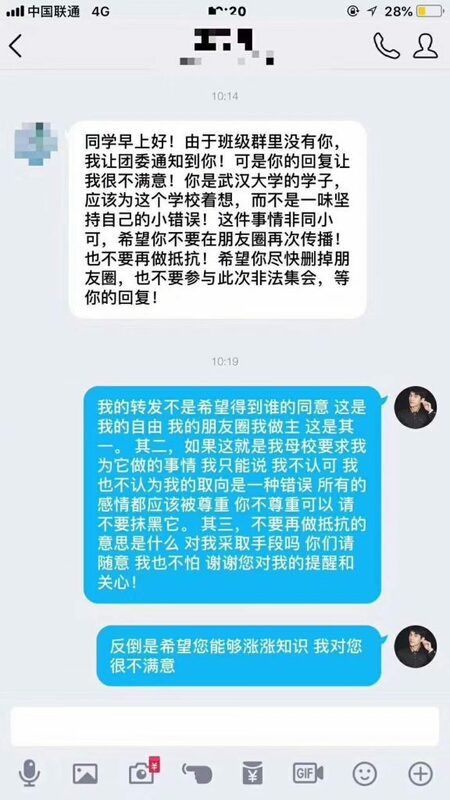 They are preparing a “lobbying enterprise,” a campaign involving flyers and other offline measures, hoping many students “will continue to pass on this ‘goodwill’.” How malicious! School group committee notification: Every grade please pay close attention. Today there is a WHU Sexual Orientation Research Group activity off-campus, namely a rainbow flag activity. Member students are exhorted not to participate. @All members. Regarding this little colored flag activity, everyone should have heard something about it by now. I believe many people don’t oppose the meaning or sentiment behind the activity, but everyone should remember this: Said activity’s organization has not gone through legal application or registration. 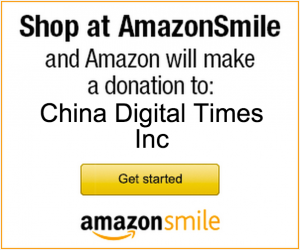 It is proceeding without permission from Wuhan University, for its flag. This merits everyone’s careful thought. Everyone is expected to speak and act prudently. Prior to handling matters, one must have sound judgment. Pay attention to the ways and means of handling things. Be sure not to let your mood be influenced by public opinion propaganda, or things put out by feverish minds. Notification concerning selection of outstanding young people from my school, as representatives to visit Russia, and participate in the “China Russia Youth Forum”. Interested students please submit the “China Russia Youth Forum” application form (see attachment) before 11 AM today to the School Youth League Comprehensive Office. Registration is by hardcopy form only. Good morning classmates! Regarding rainbow flag activities, everyone should have heard something about them by now. Here I remind everyone that said activity’s organization was not done by legal registration and application. Please, everyone think about this carefully. Speak and act cautiously, be discreet in word and deed, and plan your academic life well. Today it is reported that some off-campus group plans to launch an on-campus rainbow flag activity. According to a notice in the spirit of the school, everyone please remind your classmates they must not participate in this kind of activity, or even look on as a passive spectator. Be prudent in words and deeds online. If you encounter trouble, report it in a timely fashion. 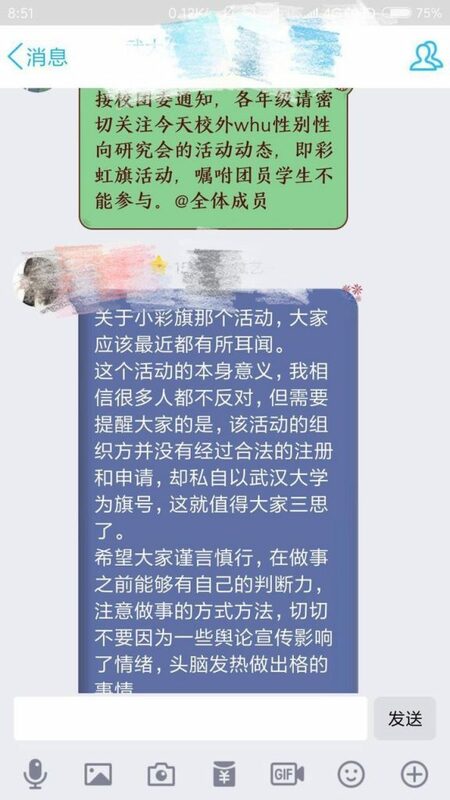 Following teachers’ efforts to discourage participation in the activity, on May 16 the Wuhan University Sexual Orientation Equality Research Group announced on WeChat that, “due to unforeseen eventualities,” the planned activities would be changed. A campus classroom would be used instead of the originally-granted public space, and 150 rainbow bracelets and awareness leaflets would be set aside in the library.